You'll gladly pour over stacks of cookbooks to find the perfect recipe or leaf through piles of catalogs to find the perfect chair. It's not surprising that your home reflects your discerning taste. From the ample outdoor living space to the distinctive architectural details, every area of the Penstone reveals your preference for style and comfort. 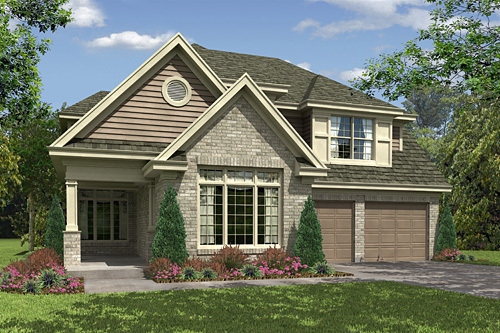 The convenient first floor plan starts with a side entry and covered porch. Inside, you find a study just off the foyer and a cozy dining room with optional two-sided fireplace. The two-story family room opens into the kitchen and dinette. A laundry is within steps of the garage entrance. Up the wide staircase, you'll find the second floor hall that overlooks the family room. It leads to a grand master suite with walk-in closet, three more large bedrooms, and a hall bath.